Sanding the table. 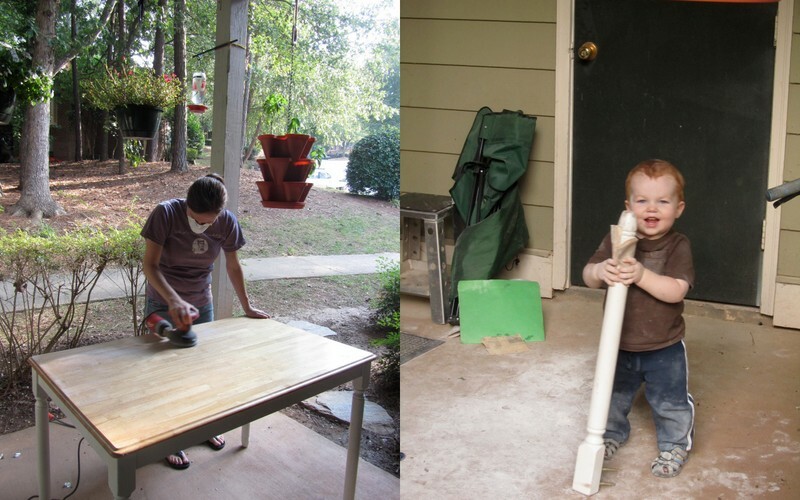 One afternoon I was sanding the legs while Charlie played outside. Without any prompting he picked up a sheet of sand paper and got right to work. We have been on the lookout for a new kitchen table for a while. It had to have four legs so it wouldn't tip over with toddler antics (ours was a round table with a single leg), be able to fit 6 people (we like having people over, hint, hint), and fit into our little dinning area. Oh, and be budget friendly. We found just the one on Craig's list a few weeks ago but it needed a little bit of a makeover. The solid wood top had some serious scratches and the whole thing was a bit roughed up. Also, I prefer dark woods and this one was very light. Thanks to my mom's refinishing lesson during her spring visit (we re-stained and finished the living room furniture handed down from my grandparents), and Keith's woodworking skills and tools, we were ready to take it on. 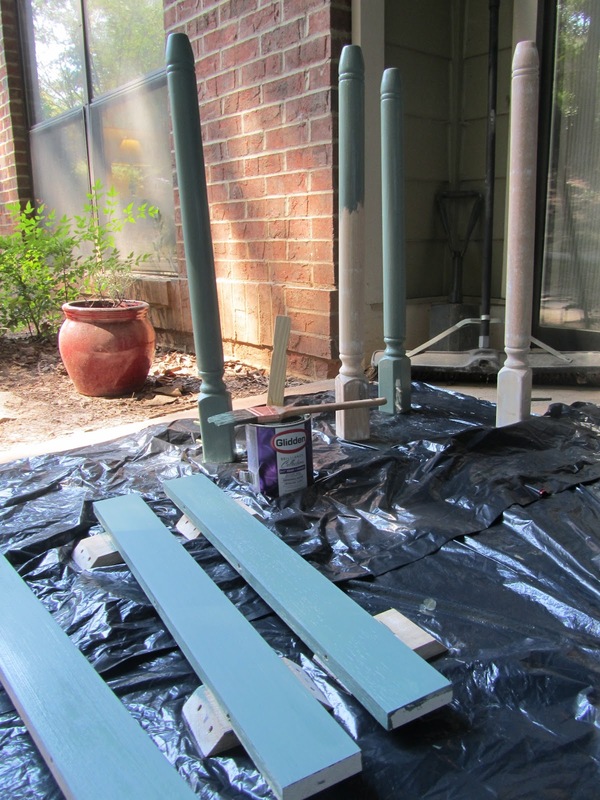 After remembering a farm style table I saw on pinterest (yep, pinterest), I decided that this particular shade of green was perfect. As fate would have it we bought this small can of paint when we moved into this apartment intending to paint an accent wall. We decided it was too dark for the wall but kept the can. Serendipity! Before and After. Don't worry, we didn't really trade Charlie in for a chair. Great job!! 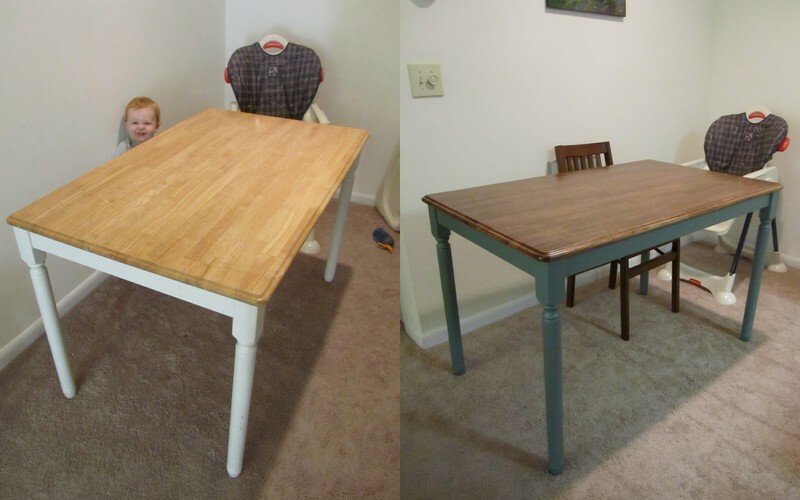 I've always wanted to sand and repaint a table. But my favorite part of that was "Keith says that it is growing on him, but the fact that I love it is what really matters to him." So wonderful!!! Way to go! That looks great. Awesome project, it looks great! Table looks great, but not as great as that sweet little face of your helper. Love the darker wood. So much richer looking. Agreed! Beautiful table. You're amazing. My favorite part was where you said "Don't worry, we didn't really trade Charlie in for a chair."